I was looking for a little steam cleaner to keep up on my new carpets. I have two young grandkids, boys, and well, they are messy. This works great for me. I steam clean on a pretty regular basis and this absolutely does the trick. It's not heavy. It's super easy to use, empty, and clean. I would definitely purchase again. So after having my cat throw up all over the place and NOT being able to get the stains out myself, plus the added fact that I have children that seem to make a mess everywhere, I decided it was about time to invest in a carpet cleaner. I went with this one primary based on the price, although at the time I had no idea what to expect. I have to say that I was more than pleasantly surprised by the results. It didn't take me long at all to figure out how to work it, overall it's extremely easy to handle and to use. Going over the carpet the first time around you could already see how clean it making it, and after the 2nd and 3rd time my carpet looked close to begin new once again. It was able to get up so much dust and stains from my carpet, as well as pet smells. I would recommend that anyone who has animals, kids, and carpet to buy this product. 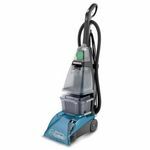 It's well worth the invest and in the realm of carpet cleaners and comparing prices it's affordable and in return you get more then your values worth. I got to use it twice. Now the unit heats up, but the brushes don't turn and the solution won't spray. I followed all directions for proper set up and cleaning. Very disappointed. There's a lot of trouble-shooting and repair advice on-line, so I don't think ours was an unusual situation. Maneuverability When it was working, it went straight. Very poor turning at all. Ease of Maintenance Apparently not good, if following their directions doesn't even work to keep it in working order. Suction Performance Not great. I had 2 hairy dogs when this was actually working. I had to vacuum the floor twice (with a Bissell pet-hair vacuum-also not impressed), and this machine still had problems with the remaining hair. Versatility As expected, when it was working. It cleaned the carpets well. Design The water tank was awkward to fill and replace, the front cover snaps off too easily. Durability For the price, I should have gotten way more use out of the thing. Not impressed at all. This product is excellent at cleaning carpets. 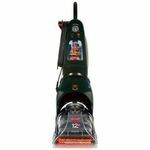 It really does a great job removing stains and it doesn't leave the carpet too damp. 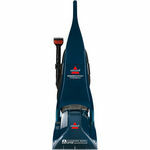 Maneuverability It is a little heavy to push and pull on but overall great for a carpet cleaner. Ease of Maintenance Easy to keep clean. Suction Performance It does great. The carpets are only damp after using this product and not soaked through. Design It is easy to use and the design is nice. Durability Seems pretty durable. I am delighted with this product! I used to have a particular company come clean my carpets every few months. They did a good job, but it took about 8 hours (at least) to have the carpets dry. 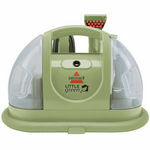 Now, since I have this carpet cleaner and can do it on my own,I am really thrilled. It takes very little time to dry and the soil is history. The suction is superb. The only problem I have is that with 3 golden retrievers, the hair (yes, I vacuum first) sometimes clogs things. The suction with this thing is tremendous. Love it! Suction Performance See above. Oustanding clean and protection for your carpets! 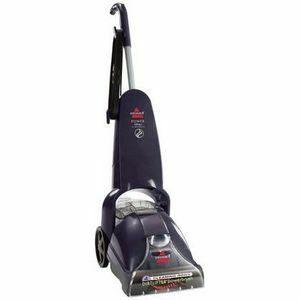 This **Bissell PowerLifter PowerBrush Deep Cleaner** is wonderful! I had a black ink stain on my home office floor from when I tried to change my computer printer ink about a few months back. This wonderful steam cleaner was able to get the black ink stain up and leave my carpet looking new! I was weary at first becaise companies can stretch the truth a bit when descibing their products but this steam cleaner did the job, and I feel like I got my money's worth. You could pay less for another brand but why? You will only end up having to buy a new one because that ones breaks down right when you need it the most. I finally got the picture and chose Bissell after a neighbor advised me about a cleaner she had been using from Bissell for 10 years and it still worked great. 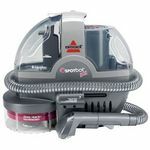 I eventually plan to buy one as a gift for a friend of mines whose carpet can use a good deep cleaning. I encourage you all to purchase this if you want to get your carpet beautiful again!